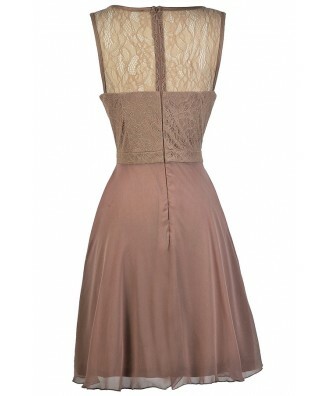 This lovely mocha lace and chiffon dress has the perfect touch of glamour, with its embellished waist. The Mocha Glamour Embellished Lace and Chiffon Dress is fully lined, except at the shoulder straps and top back, which are semi-sheer. 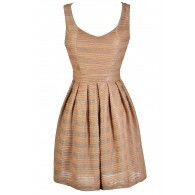 It has a rounded neckline, wide shoulder straps, and an empire waist. 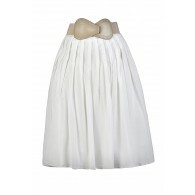 The top is made of delicate lace and the flowy skirt is made of chiffon. A band of embellished beading at the waist adds a touch of sparkle to this look. A hidden back zipper completes this dress. The Mocha Glamour Embellished Lace and Chiffon Dress is perfect to wear to any party. It would also make a chic bridesmaid dress. Details: Lined except at straps and top back. Hidden back zipper. 100% polyester. Hand wash cold water. Do not bleach. Do not tumble dry. Do not iron. Do not dry clean. Small measurements: Length from top of shoulder to hemline: 36". Bust: 34". 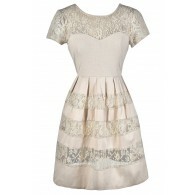 You have added Mocha Glamour Embellished Lace and Chiffon Dress into Wishlist. You have added Mocha Glamour Embellished Lace and Chiffon Dress for Stock Notification. You have set Mocha Glamour Embellished Lace and Chiffon Dress as a loved product. 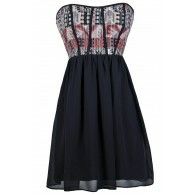 You have removed Mocha Glamour Embellished Lace and Chiffon Dress as a loved product.